From the EverQuest II Player Manual:Paladins are a hybrid class with a fighter base. 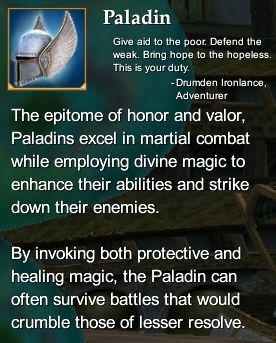 Paladins wield both healing and buff abilities along with the general combat arts that all fighter based classes get. Only goodly or neutral races may be a paladin. The only way an evil aligned race may play a paladin is to betray as a shadowknight to a good aligned city thereby changing their faction and in the end their class to paladin. Paladins have many playstyle options to choose from because of their hybrid abilities they can be effective as healers as well as tanks depending on the choices that are made in spending alternate advancement points. Because of their innate ability to wield divine magic the paladin has an edge against the undead. Supernal Armor of the Squire (20) - from the Ian's Forgetful Family series of the Armor Quest Series. This page last modified 2011-08-25 22:55:29.